Like the haunted house set we first see at the start of writer/director Cary Hill’s debut feature Scream Park, a horror-themed amusement park seems like a natural location upon which to build a slasher movie. And in using the same ingredients in plot, character and structure that have pervaded the genre since its late ‘70s/early ‘80s post-Halloween screaming virginal teenage girl-centric heyday, that’s exactly what Hill does in this old-school horror movie. 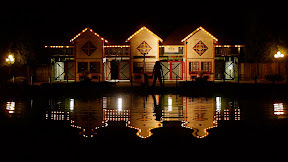 In addition to using the same paradigm, Scream Park harks back to the era from start to finish by including technological and cultural touchstones from boom-boxes to the type of punks that Corey Feldman would’ve played three earlier alongside modern-day conveniences like cell phones and motion-detection lights. While we’re confused by the early introduction to way too many similar characters at the same time, we’re quickly charmed by Park’s obligatory nice, smart girl lead Jennifer (capably portrayed by Wendy Wygant). Initially, because the roles that they inhabit fill a one-word description so well, I wondered if perhaps they might have been intended as exaggerated satirical genre caricatures of the same type of “princess” and “athlete” archetypes that filled the seminal John Hughes ‘80s classic, The Breakfast Club. However, the satirical theory fizzled as the killing took center stage and Hill's teen movie switches gears, focusing on the cat-and-mouse game that is being played around the park. Needless to say, Hill’s film is at its best when he keeps things simple both for the actors and the viewers as just when we’ve begun to be able to tell the characters apart (despite not knowing a few names), the horror begins. With more money, a more talented cast, slicker special effects and much better lighting (to the point that at times I had to squint in my most vibrant color temperature settings), the film could’ve easily become a modern cult hit. 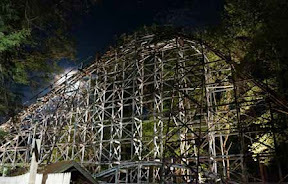 Yet as it stands in spite of its technical and professional limitations, the downright entertaining Scream Park scored a hit among genre film festival goers who no doubt responded to its obvious knowledge of and affection for the films that paved the way while sitting back to enjoy Hill's ride. While I kept thinking about just how damn good the film could’ve been if only it had a script punch-up (or fill-in-the-blank), the one thing that kept me interested was just how well-timed and ingenious it was of Hill to venture quite far back into the past to take on such a monster of a project for his first time out. And this is doubly refreshing and impressive when you realize that far too many of his contemporaries are overcrowding the marketplace with found-footage, do-it-yourself horror movies. With this in mind, any attempt to reinvigorate the genre is more than welcome and that's exactly the itch that's scratched by Scream Park. Reminiscent in spirit of Ti West’s debut effort and ‘80s era throwback, The House of the Devil, I only hope that with more funds, experience and talented new collaborators, Hill will embark on a career with a similar word-of-mouth appeal. 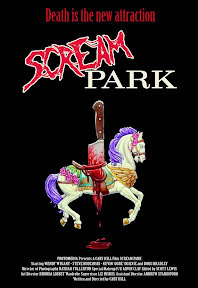 For regardless of its flaws, Scream Park is Saturday midnight screening fun and Hill knows his audience well – no doubt as a filmmaker weaned on the rollercoasters of genre classics the same way those who lived in Anaheim were weaned on the rollercoasters at Disneyland.